Pardon me everyone, but I’m in a chocolate coma right now. OMG. 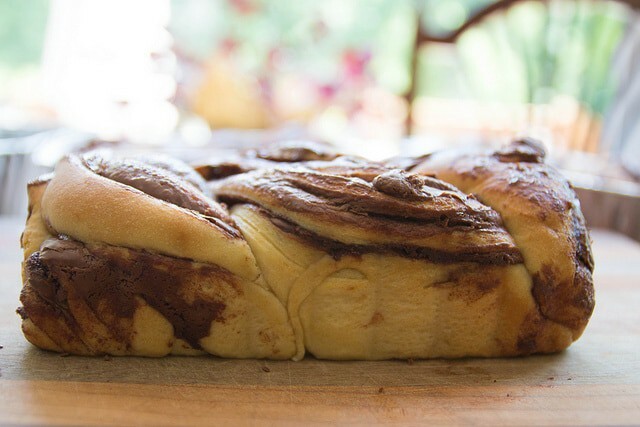 Chocolate babka is another recipe that I’ve been wanting to try for a long time. A very long time. Maybe since the Seinfeld Days?? Not surprisingly, there are no babka’s in my past. No secret family recipes. 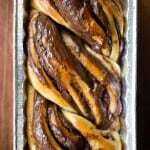 No grandmother’s who made babka. Sure, there are plenty of recipes out there. But I wanted to try something that was out of this world. Something worthy of the calorie splurge. 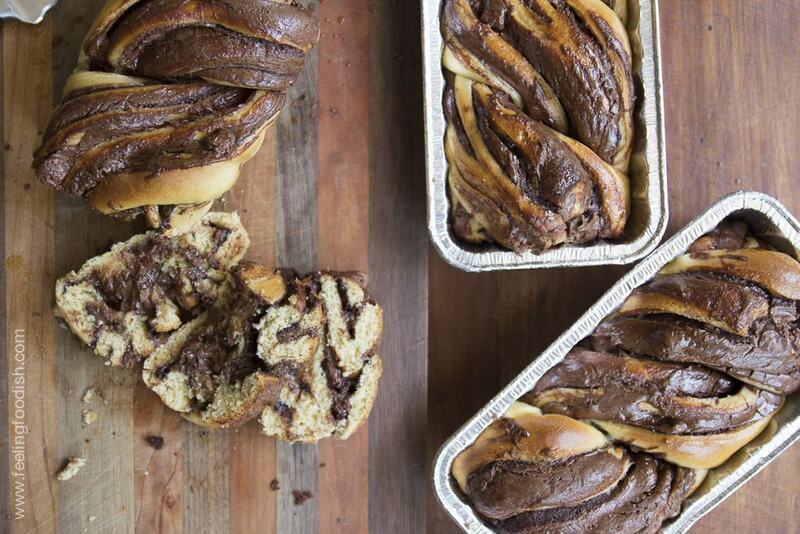 And so I researched and learned that Bread Bakery’s chocolate babka is one of the best in NYC. The very next day, I came across this list of 25 bakery’s to visit before you die, and Bread Bakery came up again. And so I researched and stumbled upon this recipe from the Wall Street Journal. Now, frankly, I thought this bread had way too much Nutella. I know, I know – can you ever have too much Nutella? The photos above show what I got by following (weighing the Nutella) the recipe. The loaf that you see above was the middle loaf, which had the most Nutella in it. In other words, I didn’t even out my Nutella as much as I should have and so I have a Nutella explosion. When I cut the other 2 loaves the next day, they looked much more like the “real thing” and so the moral of the story is to make sure you spread your Nutella evenly!! I also learned it’s really important to let the loaves cool completely (cool for a full 2 hours) before slicing. And if you have a food thermometer, the loaves are finished when the center reads 180 to 190 degrees. 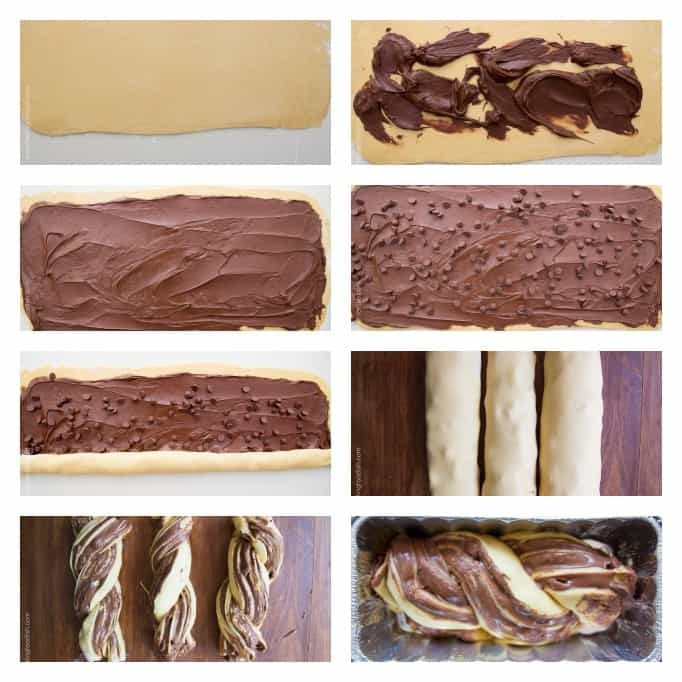 Judging by the recipe source photos, there doesn’t appear to be an overload of Nutella and also reviewing the real thing here and here, there does appear to be a little less Nutella in the real thing. If you want something with a little less chocolate try this one by King Arthur bakery. 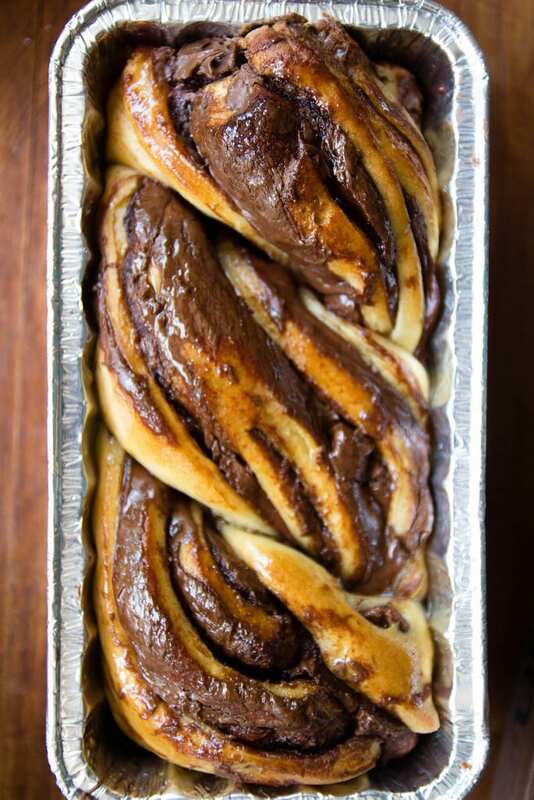 Makes 3 small loaves of sweet and very chocolatey babka. Add sugar and water to small pan and heat till boiling. Reduce to simmer for 2 additional minutes and them cool until needed. Remove the dough from the refrigerator and flour your workspace. 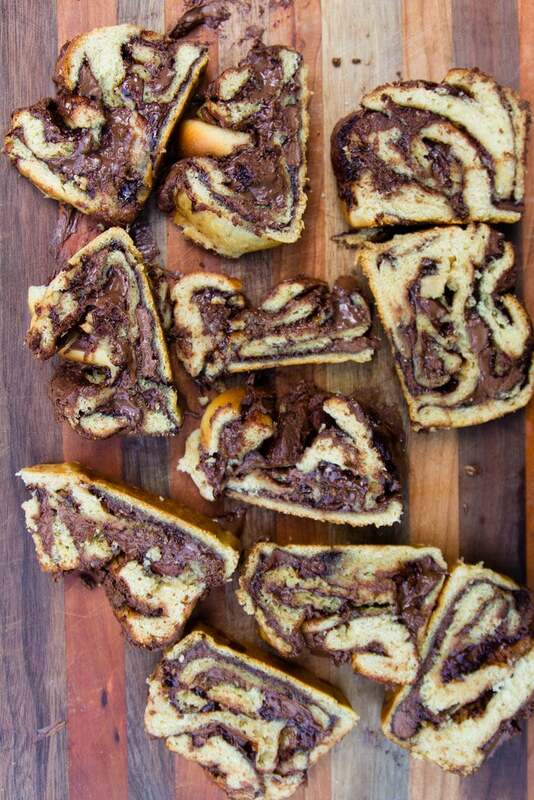 Roll the dough into a 10 by 28 inch rectangle and them spread the nutella on top followed by the chocolate chips. Form an x with each pair of pieces and then twist each pair around each other. Preheat oven to 350 degrees and bake for 25 to 30 minutes (less if you have a convection oven, more if not). Internal dough temperature should be about 180 degrees when finished. Let cool for 2 hours before slicing or the center of the loaves may seem raw. *It is very important to spread the Nutella evenly!!! my center loaf had too much Nutella in spots. If you prefer less, decrease the Nutella by about 1/3 depending upon your tastes. How should the instructions be modified if I refrigerate for 24 hours? I agree with you, Seinfeld was the inspiration, but then again it is for a lot of things, right. I was wondering if something else can be used instead of the Nutella. Maybe a chocolate pudding. Not a Nutella fan. That couldn’t have been in the original Tel Aviv recipe. Good point! Maybe just plain ole chocolate chips? I tried following your recipe, baking it at home. I am facing some issues even after my second attempt on this recipe. Somehow the babka is not thoroughly baked even letting it cool for more than 2 hours. I baked this at 350 for 30 mins in my convection oven (Fan Oven), and its still not fully baked inside, it is still doughy and some tiny parts powdery. Please help! Oh no! That’s disappointing. From what I understand, convection ovens run a lot hotter than conventional ovens. So, you should reduce the temperature to 325 (I’ve even seen some references say reduce by 25 to 50 degrees) and bake until golden. Also, you can cover the top with aluminum foil once it’s brown and keep it in another 10 minutes or so (depending on just how underbaked it is) if you know the center isn’t baked (it must reach 200 degrees F using a kitchen thermometer). The loaf should be finished when the reading is at 200 degrees F – that way, you will know the center is baked. I hope this helps! Thanks so much! Will try it again another time this weekend! I came across your blog, upon my search for a NY style pizza dough recipe and I’m so glad I did!! Did you know that Bread Bakery originated here in Tel-Aviv before opening their NYC branch? Lucky us! Though the main article is in Hebrew, the short video itself isn’t narrated and I hope your readers will find it helpful for the tricky twist part. Many thanks and looking forward for future posts! Hi Guy – That was a great video – thanks so much for sharing it! I was able to translate the page with Google Chrome to English from Hebrew and read the recipe as well. The recipe is nearly identical to the one published here, with few changes (fresh yeast vs instant/active which is easier to find here and they didn’t specifiy using both pastry and bread flour – I will probably just use all purpose when I make it again). About to try the dish, Do you grease the tins? This looks delicious! I love chocolate…thanks for sharing!